It is also known as Tis Abay in the Amharic language which if translated to English, means “the smoking water” named drawn from the fact that the dropping of the water creates a smoke-like bounce of water droplets in a fantastic and magnificent scene. 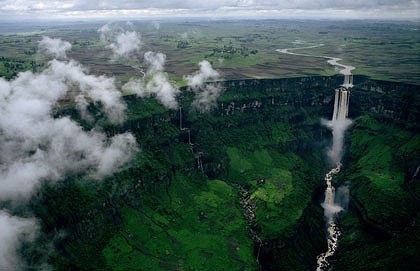 The Blue Nile Falls is considered to be one of Ethiopia’s best known tourist attractions site in the country. 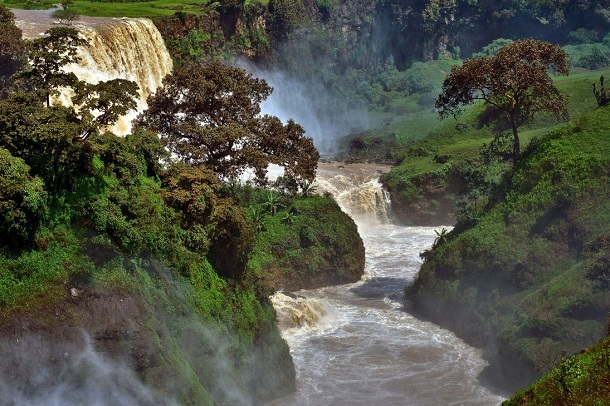 The Blue Nile Falls is located at the upper course of the Nile River about 30 km downstream from the town of Bahir Dar which is about some 319.67 kilometers total in distance from the national capital, Addis Ababa. The waterfalls consist of four main streams that is originally different from a ooze in the dry season to over 400 metres wide in the rainy season as a result of the diversion of Lake Tana which has to some extent reduced the variation of the water since 2003 in pursuant of a hydro-electric station by the Ethiopian government but nevertheless, the falls is still at its best offering a good atmosphere for those who visit the place. This has caused a decrease in the flowing water of Blue Nile Falls, but the fact still remains that the full beauty of the falls can still be appreciated during Sundays and holidays because the hydroelectric station is believed to only operates during weekdays and for this reason, it is advisable for tourist to visit the place on Sundays or Ethiopian public holidays. 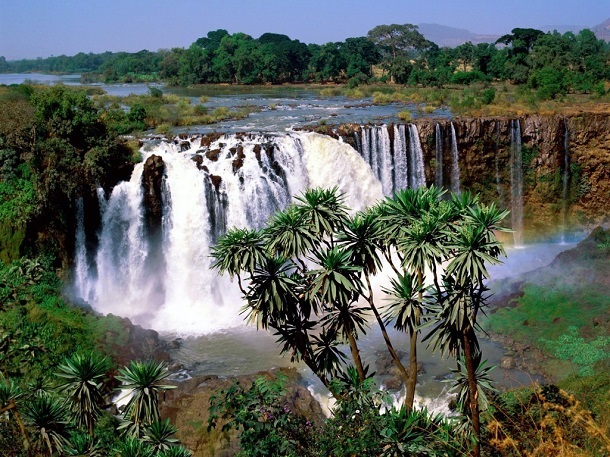 Ecological experts say the Blue Nile Waterfalls has isolated the ecology of Lake Tana from the ecology of the rest of the Nile and this has helped played a role in the evolution of the endemic fauna of the Lake Tana. The flora around the falls can also be appreciated; there are many plant species endemic only to that area. The Blue Nile Falls are also enriched with different types of wildlife that can only be found in Ethiopia as one of the best scenes in Africa. 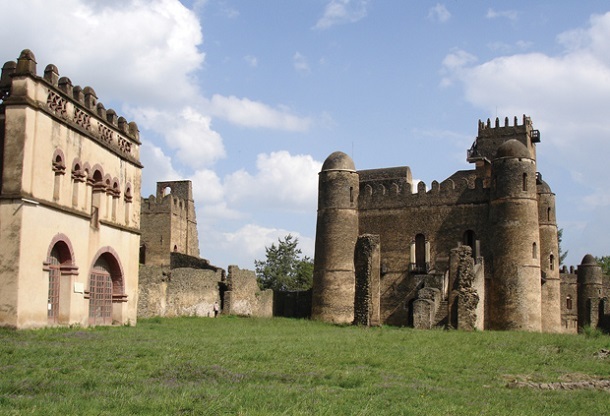 The Lake Tana itself is home to many island monasteries which were believe to be built by the missionary man Manuel de Almeida from Portugal. Some of the monasteries can be visited after a short boat ride on the Island and it also has many decent restaurants and hotels along its shores. From a short distance downstream of the falls, is the first ever stone bridge (Portuguese Bridge) constructed in Ethiopia which was believed to have been built under the command of the legendary Emperor, Susenyos in 1626, serving as a bonus to tourists who visit the Blue Nile Waterfalls. According to Manuel de Almeida (1580–1646) a native of Viseu, from the Kingdom of Portugal, who entered at an early age into the Society of Jesus, and went out as a missionary to India, Ethiopia and Eritrea particularly in the Lake Tana area in Ethiopia, said stone for making lime had been found nearby along the tributary Alata, and a craftsman who had come from India with Afonso Mendes, the Catholic Patriarch of Ethiopia then supervised the construction of the historic bridge which some call the Portuguese Bridge. The Blue Nile Falls has an enormous height of 37 to 45 meters or around 150 feet and its width is estimated at about half a mile, making watching the river water drop down the waterfalls truly breathtaking for people who visit the place. Reaching the Blue Nile Falls is easy as there are various trips that can be arranged as it is a main tourist spot in Ethiopia. There are many locals that make their income from the benefits of tourism; many are selling food and drinks like calabashes and sodas. The best of accommodation await any tourist who visits the Blue Nile Falls as there are hotels available at a few kilometers away from the falls. 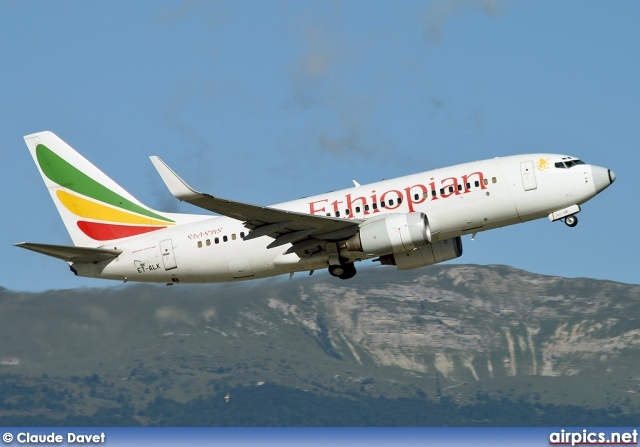 Ethiopian Airlines issues a statement about their B787 incident at London Heathrow Airport: Today on Friday, 12 July 2013, smoke was detected from Ethiopian Airlines B787 aircraft with registration number ET-AOP, which was parked at London Heathrow airport for more than eight hours. The aircraft was empty when the incident was observed. The cause of the incident is under investigation by all concerned. Further statement will be issued in due course, as we receive more information. London’s Heathrow airport closed to flights following a fire involving a Boeing Co. (BA) 787 jet operated by Ethiopian Airlines Enterprise, while a second Dreamliner was forced to abandon a trip with technical issues. Shares of the U.S. planemaker had their biggest drop in almost two years. The aircraft, Boeing’s newest model and beset by battery-related fire incidents that grounded the global fleet earlier this year, was sprayed with fire-retardant foam after the Heathrow event. No one was on board and there were no injuries. Takeoffs and landings were suspended at Europe’s busiest hub for about an hour while emergency services attended the jet, before flights resumed later with significant delays. The cause of the fire is unknown, Heathrow Ltd. (FER) said on its Twitter feed, with television pictures appearing to show damage on the rear upper fuselage close to the aircraft’s tail. Ethiopian Air said the aircraft had been parked at Heathrow for more than eight hours before smoke was detected. “The cause of the incident is under investigation by all concerned,” Henok Teferra, a spokesman for the carrier, said in a text message. The Ministry of Tourism of the Arab Republic of Egypt is proud to proclaim a new era for Egyptian tourism following the revolution of June 30, 2013. This statement was received by eTurboNews from Mr. Mohamed Gamal, general manager of the Egyptian Tourist office in Frankfurt, Germany. Mr. Gamal went on to say:” Every tourist visiting Egypt presently is a most welcomed guest, whose security is safeguarded by the Egyptian people and by the authorities, and all must be assured of their safety and ability to complete their planned visits without disruption. Their families and friends at home should be equally reassured. Tourists booked to visit Egypt this summer are equally reassured that there is no impediment to their visit. They will come to enjoy Egypt as millions of tourists have done for years and years, in safety and security, welcomed by their friendly and hospitable Egyptian hosts. Even during the heat of violent protests in Cairo, tourist enjoyed diving and beautiful beaches away from the Capital. Egyptians however remain deeply divided about which direction their country should go as supporters and opponents of ousted Egyptian President Mohammed Morsi. Hundred thousands went to the street on Sunday. The protests come two days after clashes left 36 people dead and more than 1,000 wounded. 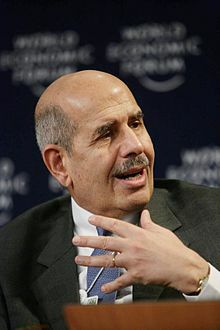 Away from the streets, an attempt to install Mohamed ElBaradei as interim prime minister was quashed after an Islamist group objected to the Nobel laureate. State media and other sources had confirmed the appointment on Saturday, but later in the day the president’s spokesperson walked it back. The latest statement by the Ministry of Tourism spokesperson in Germany demonstrates how important travel & tourism is for Egypt as an industry. Most likely tourists will continue to enjoy unspoiled beaches, but may have to stay back from Cairo and the Pyramides for some time. FYI: The U.S. State Department and UK Foreign and Commonwealth Office have urged citizens to cancel travel plans to or within Egypt, amid ongoing protests and renewed violence in the country. You are currently browsing the TOURIST LIFE TRAVEL & TOUR blog archives for July, 2013.